nos Açores não há açores. : já sabiam disto? Às vezes (raras), as visitas a um certo centro comercial da cultura ainda me conseguem proporcionar agradáveis surpresas. Foi o caso deste "Pygmy", o sucessor - pouco menos de um ano depois - de "Snuff", que fez as minhas delícias no passado Verão. Nem eu fazia a mínima ideia que o deus Palahniuk tinha mais um na calha e, no entanto, aqui está ele. Em minhas mãos! 'Begins here first account of operative me, agent number 67 on arrival mid-western American airport greater _______ area. Flight ____. Date ______. Priority mission top success to complete. Code name. Operation Havoc. town), chicken neck mother, pig dog brother, and the disconcertingly self-possessed cat sister introduce Pygmy into the rituals of postmodern American life, which he views with utter contempt. Along with his fellow operatives, all indoctrinated into the mindset of the totalitarian state, he is planning something big, something truly, truly awful, that will bring this big dumb country and its fat, dumb inhabitants to their knees. Pygmy is a comedy. 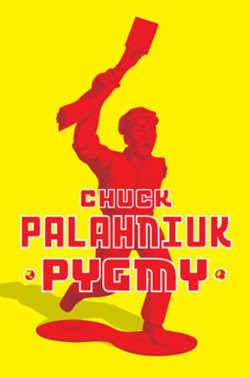 It is also Chuck Palahniuk's finest, most ambitious novel since Fight Club. Mais um para devorar de um só trago.